The idea came during an especially challenging time for Evan Kent, who had recently turned 50. 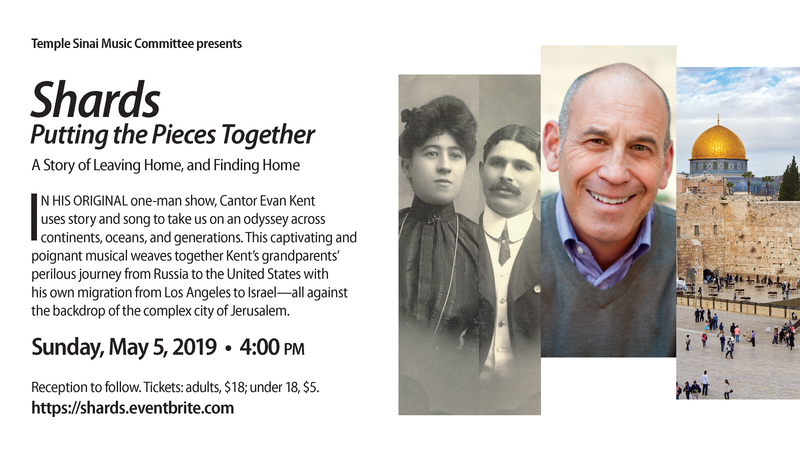 In addition to that landmark anniversary, he had made aliyah to Israel with his husband after a career in his native U.S. as a Reform cantor, most recently at Temple Isaiah in Los Angeles. It was 2014. Kent was adjusting to life in his new country. The previous year, he had taken a position as a liturgy and cantorial instructor at Hebrew Union College’s campus in Jerusalem, similar to a posting he had had in Los Angeles. Then troubles in Gaza burst out again, with Israel suddenly on a war footing. It shook him. “I sort of flipped out, trying to figure this all out,” Kent says. Having left the familiar and comfortable, he was going through a dangerous time but also realized his crisis was personal too. It dawned on him that “I was no longer a synagogue leader.” He needed to explore who he was, who he had been, and where he had come from – going well beyond his present day-to-day existence. A counselor suggested that he take a stab at “rebuilding my old identity,” as Kent puts it. Find out who he was at his core. Thus did the “Shards” project begin, as an exploration of his own and his family’s past, putting the pieces back together as one might try of, say, a broken vase. “We are all sort of sojourners or travelers in life,” says Kent. With spring on the horizon, he notes that journeying is an important element in the Passover story. With that in mind, Kent sought out the tales and thoughts of those who had been on the path before he arrived. The travelers along his family trail were his grandparents, who migrated from Minsk to Amsterdam to the New World beginning in the first decade of the 20th century. In “Shards,” he takes on the roles of those ancestors, creating monologues for various family members that place the audience intermittently back and forth in time. Besides the other family characters, he of course also plays Evan Kent, who has had his own journey of note. Indeed the Kent family story has come full circle as his life has taken shape in Jerusalem. His grandparents have been gone in the flesh since the time he was very young, so it was by no means an easy task even to begin framing the show. It took Kent two years’ worth of research and creativity to meld the stories into a cohesive presentation, complete with song, choreography and scenery. For now, the focus is on “Shards,” which he performs regularly at temples and elsewhere throughout the United States. Even today, a few years into the project, the cantor/grandson notes, the family history can vary with each retelling. Yet the familiarity not only remains but strengthens.